Welcome back to Study Skills – our series of short, fun animations that give you the tools and knowledge you need for distance learning success. This time we're looking at a skill that is vital for successful studying: critical thinking! You've probably heard the term 'critical thinking' before. It's a crucial skill to acquire if you want to become an independent thinker and achieve academic success. But what exactly is critical thinking - and how do you do it? Scroll down and watch the video to find out! Coffee is better than tea. That's an opinion. It's not an argument in academic terms, although you might want to argue with the opinion. Constructing good academic arguments is a vital academic skill: to start doing this, you need to learn to distinguish fact from opinion. Watch the video and listen out for FOUR critical thinking steps to take when someone tells you "coffee is better than tea". Write them down if you like: you can check your ideas – in an activity – later on this page. That's an opinion. It's not an argument in academic terms, although you might want to argue with the opinion. Statement one: Caffeine stimulates the brain and nervous system. Statement two: Coffee contains more caffeine than tea. And statement three is the conclusion: Therefore coffee is more stimulating than tea. An argument is a collection of statements which, when you consider them together, allows you to make another statement or a conclusion. Making and evaluating arguments is one of the key functions of critical thinking. We'll come back to this. You've probably heard this term 'critical thinking' before. But what exactly does it mean? It's what you do when you evaluate information and make decisions. And it's crucial if you want to become an independent thinker: if you want to think for yourself. And if you want to get good grades. You can defend your opinions and evaluate theories, finding their weaknesses and strengths. So, it sounds like a good thing, doesn't it? But how do you do it? Back to our argument. If you're a critical thinker and someone tells you coffee is more stimulating than tea, what do you do? First, examine their argument. Is there a logical connection between the statements? I think so. Then you'd examine their sources. Ask questions like these: whose work is it? When was it written? How was the research funded? What methods were used to find the evidence? Is it objective – what’s fact and what’s opinion? What has been left out? What other perspectives or points of view could there be? Ask questions to analyse these sources, compare them with other sources, and synthesise your findings. And it's important to try to put your own biases to one side. We all have them: "I have to say I prefer coffee, so I'll look for evidence that supports my view." And look out for any assumptions. "Well, coffee's good for you, isn't it?" So, go out, find out more about this huge topic and try it out for yourself. Critical thinking is like a muscle: it gets stronger the more you work at it. Of course, you'll need a fully alert and stimulated mind in order to get down to work. Which leaves one question: which is better, coffee or tea? What four key steps for critical thinking were mentioned in the video? Answer the questions to check you've understood! What was the first step mentioned in the video? Ask questions to analyse what is used to back up the argument – who, when, how, etc. What was the second step in critical thinking? What was the third step to critical thinking? What was the fourth step in critical thinking? Time to review what we've learned about critical thinking. Check to see if you identified all ten tips! Learn to spot opinions like 'coffee is better than tea' – these don't form an academic argument and aren't supported with evidence. 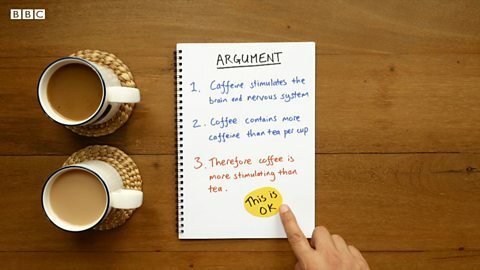 Statements – phrases that explain facts like 'caffeine stimulates the brain', and which are supported by evidence – are the foundation of arguments. An academic argument consists of a collection of statements that can be considered together to make another statement or conclusion. Critical thinking is the ability to evaluate information and make decisions based on the value of this information. Start thinking critically by examining arguments like the statement 'coffee is more stimulating than tea' – don't accept them without analysis. 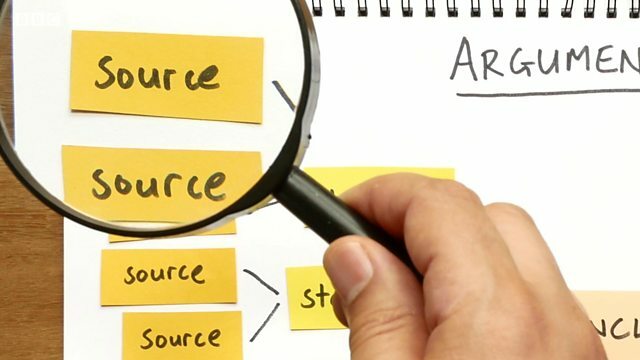 Examine the sources used to support an argument. Ask questions like: Whose work is this? When was it written? What might be missing? Avoid being influenced by your own preferences or opinions – academic arguments should be objective and unbiased. Be careful about assumptions – just because something is said by certain people does not mean that it is true. Exercise your critical thinking regularly: it's like a muscle – it gets stronger the more you use it. Visit The Open University for more on study skills – just click on the link in the 'Where next?' section.